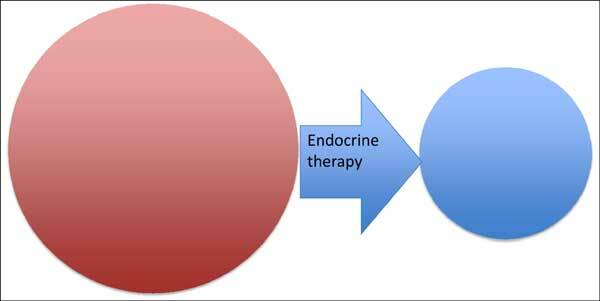 Primary endocrine therapy is an option in cases of hormone receptor positive and HER2 negative non-metastatic breast cancer. Aromatase inhibitors are considered the therapy of choice in postmenopausal patients. In premenopausal patients aromatase inhibitors in combination with LHRHanalogues are regarded superior to tamoxifen. • Patients too frail for surgery are candidates for primary endocrine therapy in order to control the disease. Treatment duration is determined by the course of the disease. • Patients with tumors not operable in general or not operable by breast conserving therapy but not fit for or with relative contraindications to chemotherapy either are candidates for neoadjuvant endocrine therapy in order to achieve downstaging. Treatment duration should be at least 6 months and probably not longer than 12 months with the individual duration depending on the experience and skills of the breast surgeon. • Patients in whom the indication for chemotherapy is uncertain due to an intermediate risk neoadjuvant endocrine therapy may undergo endocrine therapy in order to perform in vivo sensitivity testing. Treatment duration should be at least 3 months up to 6 months according to current data. Data from retrospective analyses show that short-term on-treatment assessment of Ki67 by rebiopsy or postoperative assessment of the PEPI score may identify low risk groups with no meaningful expected benefit from additional chemotherapy. In order to retrieve more detailed recommendations, results of ongoing prospective trials have to be awaited. Data regarding on-treatment genomic testing are promising but immature for clinical practice as of yet. Keywords: Breast cancer, clinical utility, endocrine, hormone receptor, neoadjuvant, premenopausal patients. Keywords:Breast cancer, clinical utility, endocrine, hormone receptor, neoadjuvant, premenopausal patients. Abstract:Primary endocrine therapy is an option in cases of hormone receptor positive and HER2 negative non-metastatic breast cancer. Aromatase inhibitors are considered the therapy of choice in postmenopausal patients. In premenopausal patients aromatase inhibitors in combination with LHRHanalogues are regarded superior to tamoxifen.